Get carried away along a most picturesque stretch of American History. Welcome to San Antonio, home of the Alamo. When you're planning an event in this city, promotion is a breeze when you choose publicity materials from the San Antonio Event Kit. 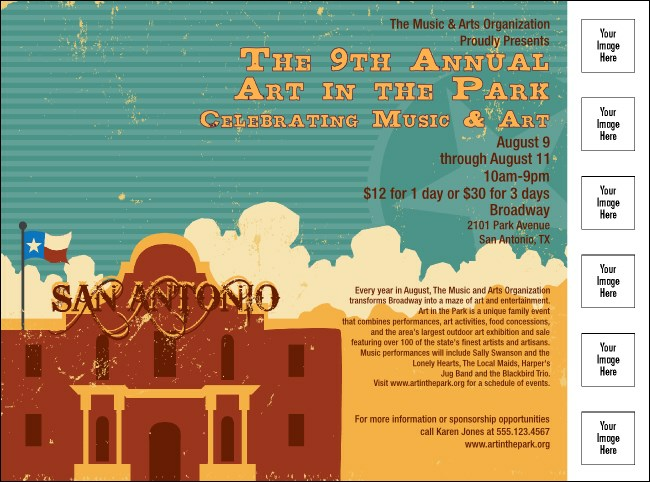 This San Antonio Flier template lets you upload six of your own images to a colorful representation of the Mission. Looking for a breath of fresh air? TicketPrinting.com has clean, new designs for every kind of event.